On Thursday former Ukrainian Prime Minister Yulia Tymoshenko announced that she will run for president in elections due to take place May 25. The divisive political figure, 53, was released from jail after three years in February after the ouster of President Viktor Yanukovych. Tymoshenko's announcement coincided with the International Monetary Fund's agreement to a loan deal with Ukraine worth between $14 billion and $18 billion. 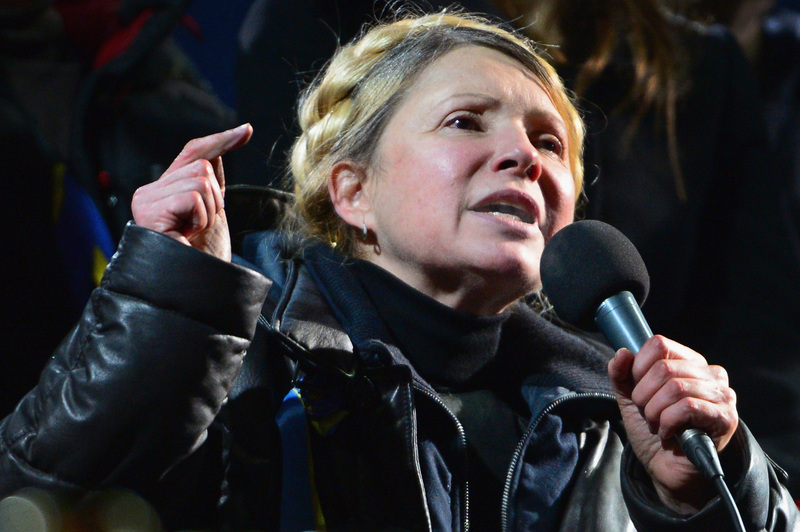 When Tymoshenko was released from prison on Feb. 22, she went straight to Kiev's Independence Square to address the crowds. The reaction she received was mixed. Although staunchly opposed to the pro-Kremlin Yanukovych, many still see Tymoshenko as part of an old order of Ukrainian politics that should not be revived. Politics in Ukraine is entrenched in corruption and mismanagement, and Tymoshenko is certainly not excluded from this. At a news conference at the headquarters of her political party, Fatherland, Tymoshenko said that she considers Russian President Vladimir Putin to be "Ukraine's enemy number one," and that she would be the candidate of Ukrainian unity. She pointed out that although her base of supporters is in the west and the center of the country, she was born in the eastern Ukrainian city of Dnepropetrovsk. But Tymoshenko — who has long used her trademark blonde locks, wound into a traditional peasant braid, as a nationalist political statement — was at the center of a new controversy this week after a telephone conversation between her and Ukrainian MP and former government official Nestor Shufrych was posted on YouTube. In an expletive-filled rant, Tymoshenko condemns Moscow's take-over of Crimea, and says that Russia should be destroyed for its actions. In a tweet responding to the leak, Tymoshenko said that the recording had been edited. Tymoshenko is one of the best known of those expected to make a bid for the presidency, and yet a mid-March survey by Ukrainian polling company SOCIS has found that only around 12 percent of likely voters are inclined to vote for her. Tymoshenko is the classic oligarch-turned-politician. She became a high-profile figure all the way back in the eighties, long before she had anything to do with politics. She and her husband were quick to take advantage of the perestroika reforms implemented by former Soviet Union leader Mikhail Gorbachev, creating a popular video rental business. In the nineties, the couple upped their game. They founded a fuel distribution company, and Tymoshenko became the head of Unified Energy Systems, a wholesale broker of natural gas. She became one of the richest and most powerful oligarchs in the whole of Ukraine. People nicknamed her "The Gas Princess." The Orange Revolution was when Tymoshenko really earned her political stripes. Joining together with opposition leader Viktor Yushchenko, Tymoshenko led a series of mass protests that ultimately led to an overturn of the results of that year's presidential elections, which were rigged in favor of Yanukovych. There was a re-run of the election, which Yushchenko won, and he installed Tymoshenko as his prime minister. After a brief honeymoon period, Yushchenko and Tymoshenko fell out. Big time. They argued all the time, which on occasion basically paralyzed the policy-making process in Ukraine. By 2009, Ukraine had the most unpopular government in the world, with an approval rating of just four percent. Only 20 percent of Ukrainians thought Tymoshenko was doing a good job. By the time the 2010 elections came around, Ukrainians had had enough. Tymoshenko ran for the presidency, but this time she wasn't popular enough. She was beaten narrowly by Yanukovych. In 2011, Tymoshenko was arrested on charges of exceeding her authority while she was prime minister, and thrown in jail, where she remained until February of this year. As we said before, Tymoshenko isn't exactly the most beloved of Ukraine's potential presidential candidates. She faces some pretty stiff opposition. The most popular figure on the scene, according to the SOCIS poll, is former foreign minister and chocolate magnate Petro Poroshenko, who has 36 percent of the support among likely voters. World Boxing Council heavyweight champion Vitali Klitschko is also a potential contender, as are several politicians that have their main support bases in the Russian-speaking east of the country.